Sunday Feast with HH Bhakti Vikas Swami ~ The Toronto Hare Krishna Temple! Toronto's Hare Krishna Centre is excited to welcome HH Bhakti Vikas Swami to our vibrant community. HH Bhakti Vikas Swami will be joining us for our weekly Sunday "Love" Feast celebrations. 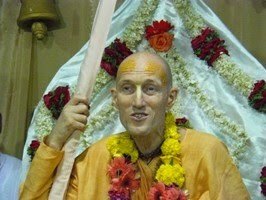 HH Bhakti Vikas Swami joined the International Society for Krishna Consciousness (ISKCON) in London in 1975 and was initiated in that year with the name Ilapati dasa by ISKCON’s Founder-Acarya, His Divine Grace A.C. Bhaktivedanta Swami Prabhupada. From 1977 to 1979 His Holiness was based in India, mostly traveling in West Bengal preaching Krishna consciousness and distributing Srila Prabhupada’s books. He then spent the following ten years helping to pioneer ISKCON’s preaching in Bangladesh, Burma, Thailand, and Malaysia. In 1989 he was granted the order of sannyasa, receiving the name Bhakti Vikasa Swami, and again made his base in India. He has since traveled widely throughout the subcontinent, lecturing in English, Hindi, and Bengali. His Holiness also travels to and preaches Krishna consciousness in other parts of the world. He continues to write books and magazine articles. His books have been translated into more than fifteen languages. HH Bhakti Vikas Swami will be giving this Sunday's Spiritual discourse. Additionally he will be attending the Saturday evening (7pm-9pm) program at ISKCON Scarborough, and the Sunday morning (11am-2pm) program at ISKCON Brampton.